Before you get married in Washington, you may want to consider whether a prenuptial agreement is right for you and your future spouse. 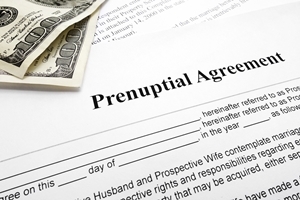 A prenuptial agreement is simply a written contract between two people used to determine how assets will be divided in the case of separation, divorce, or death. It is a complex legal document designed to help your marriage, especially when there is an asset imbalance between partners. Start the discussion early. When you and your partner begin to discuss marriage, it’s a good idea to bring up the topic early on, so that you both have time to consider all of your legal options together and can create a contract you both find agreeable. The court may also be skeptical if it discovers a prenuptial was created and signed immediately before a wedding, as both partners may not have had pressure-free time to fully consider the value of the agreement. Be honest with your future spouse. Bringing up the idea of a prenup can be an awkward conversation, but it doesn’t have to be. If you’re straightforward with your partner about your wishes and why you think a prenuptial agreement might be a good idea, it may show that you’re thinking about it on a practical level rather than an emotional one. Don’t make demands. Although you should be honest about your desire and reasons for wanting a prenuptial agreement, opening up the topic by demanding a contract is likely to start an argument. There is a common misperception that wanting a prenuptial means that there is a lack of trust in the relationship, which isn’t always the case. This should be a discussion between the two of you—not a forced agreement that one partner doesn’t want. Avoid value judgements. One quick way to make your partner feel bad is by directly comparing assets, especially when you have more than your partner. Feelings can get hurt if you marginalize your partner’s earnings and the hard work it took to acquire them. Be clear about your desires. While you do want to avoid making unreasonable demands or marginalizing your partner’s contributions to the relationship, at the same time, it’s important to be unambiguous about what it is that you want from a prenup. If your partner doesn’t understand why you want a particular term as part of your agreement, do your best to explain your reasons. Listen. Your partner’s needs and desires may not be the same as yours, so if your partner has a concern with a term that you want, be sensitive to his point of view, and look for creative solutions to compromise together. Be prepared to adapt. Your prenuptial should have room to change and grow as the circumstances of your marriage change. For example, one partner may gain a new job with significant assets or leave a job to be a stay at home parent. Having children may change your plan, too. Be prepared to create a prenuptial that can account for all the new situations you may face. Don’t give up. Prenuptials can be a difficult and complex topic. Your first discussion about it may be especially challenging, and emotions can run high. Do your best to keep a level head, and don’t give up until you reach an agreement you both can live with. One important tip for crafting your prenuptial agreement together is to engage the services of an attorney who has experience in this area of family law. Prenuptial agreements can be challenged in court, and a Washington State court may not even recognize a poorly-drafted document that’s been hastily assembled from a template found online. Your attorney will help you with every step of the process, so you and your partner are satisfied with the end product. If you have questions or concerns about signing a prenuptial agreement, or you need help creating, updating, or enforcing your existing prenuptial agreement, the Law Offices of Molly B. Kenny can help. Call us, or use our online contact form to schedule a private consultation in our Bellevue location today.